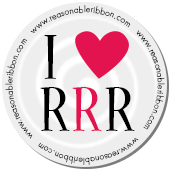 Really Reasonable Ribbon Blog: Happy Easter! Hello, crafty friends! It's Gloria with you today! I rarely get to post to the blog, so this is a treat for me! I missed out on the Really Reasonable Ribbon hop this month, so I asked if I could do a post later in the month, so here we are...later! 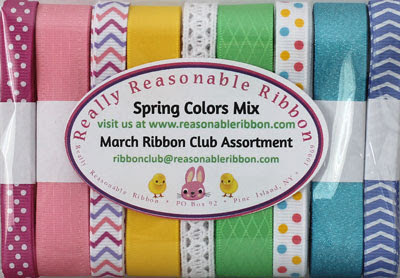 I am using the March Ribbon Club, which is filled with spring! It is like a packet of Easter eggs! I love seeing the new ribbon assortments each month. Each one is prettier than the last! 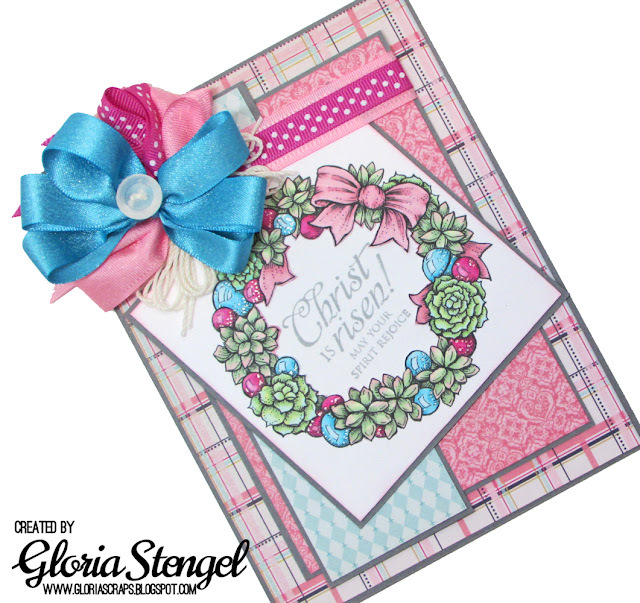 I wanted to color something to match the ribbons, so I chose this digital stamp by Power Poppy called Wreath: Succulents and Baubles. I colored the image with Copic markers, then added some sparkle with a glitter pen. I had printed the image with the accompanying Christmas message in the center of the wreath, so I cut out the center of the wreath to remove the sentiment. I then stamped an Easter message instead! 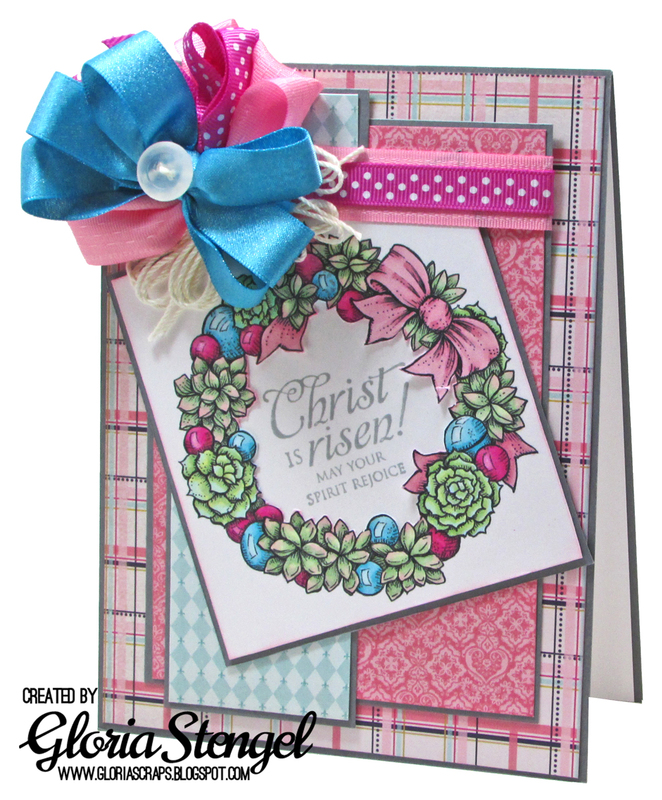 The Easter stamp is from a set by Taylored Expressions called He is Risen. I love how you can alter the stamps to get more use out of them! I matched up three of the ribbons from the March ribbon club: Garden Rose Swiss Dots Grosgrain, Sherbet Delicate Stitched Satin, and Turquoise Shimmer Satin. I created a giant, puffy bow for the card. This card will need a box or padded envelope in order to mail it! The card is 6 1/2" tall by 5" wide, which is an odd size, but I can make my own envelope and it will still fit in a standard-sized padded mailer. Win-win! The paper I used is from the Authentique Dame Collection. I used both 12x12 and 6x6 prints. 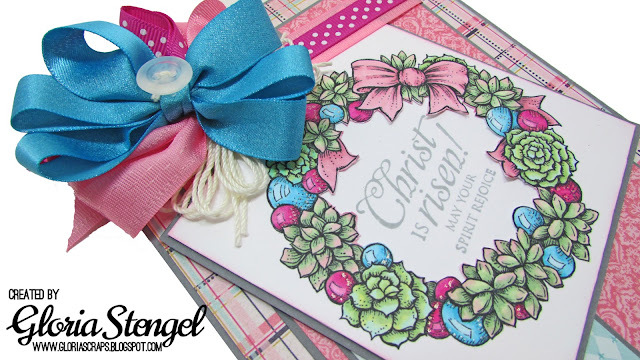 It was fun to match up prints with the Copic colors I used for the image and the ribbons from the Ribbon Club Assortment. Gloria this is just beautiful! Hippety Hoppity Here Comes the Easter Bunny!